Gluten-free pasta and bread: analysis of the quality of products available on the Italian market. The only known treatment for celiac disease is strict adherence to a gluten-free diet. In this respect, the objective of a recent study conducted by a group of Italian researchers (Neuhold, 2017) was to compare the nutritional composition of products specifically formulated for CD patients with that of analogous conventional products available on the Italian market. In particular, during the test, 235 gluten-free products and 349 conventional food products were assessed, such as bread, pasta, bread-substitutes (bread sticks, crackers), rusks, mixed bread-making flours. For each category, the average values were calculated for each nutritional component, and a t-test was carried out for independent samples, in order to assess the quantitative variables. The results are in line with the data from the literature concerning the lower protein content of gluten-free products: an issue that is not surprising, in view of the ingredients usually used to replace flours containing gluten. Several differences were found, and not always to the detriment of gluten-free products: in some cases, in fact, GF-products show better nutritional values compared to analogous conventional products. The calories content in fat and sugars of the two categories of samples can be substantially superposed, whereas the differences to the detriment of GF-products concerning the fiber and salt content cannot be extended indiscriminately to all types of GF-products or to all commercialized GF-products In conclusion, the Authors indicate that the differences are not always significant from the practical point of view, and can be easily compensated with a correct management of the diet and a responsible food choice. Determination of the glycemic index of different types of pasta obtained with different processing methods. The glycemic index (IG) represents the rise in a person’s blood sugar level caused by a particular type of food, with respect to the carbohydrate available Different studies suggest that low-IG diets reduce the risk of diabetes, cardiovascular diseases, metabolic syndrome, chronic inflammation, and certain types of cancer. In this respect, objective of a study carried out by a group of Italian researchers (Pandolfo et al., 2017) was to develop a method for determining the IG in six different types of dry pasta, obtained with different production processes. In particular, for the test, samples of 6 different varieties of products were used, whole-grain and non, and 29 healthy subjects (17 males and 12 females) aged between 18 – 46, all of them not affected by coeliac disease, diabetes and metabolic syndrome. 8 IG-assessment sessions were organized (6 for pasta and 2 as “white”, with a solution containing 50 g of glucose), with one week between each session. The blood glucose level was determined using high-precision glucose meters and capillary blood sampling. The results show clearly that the glycaemic response changes significantly according to the type of product. In conclusion, the Authors indicate that there are different process variables that may influence the forms of attack and degradation of starch in cereal by-products. 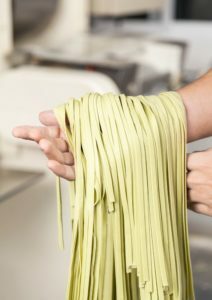 With reference to pasta, among these variables there are: amylose/amylopectin ratio in starch, degree of starch damage caused by the milling process; granulometry of used flours; temperature and drying diagram and extruder pressure.